This entry was posted on 7 September 2010 at 19:24 and is filed under formal learning, informal learning, learning management, learning model. You can subscribe via RSS 2.0 feed to this post's comments. which does a good job of laying out some of the issues. In general, I hate to think that the FLE would be considered a learning environment, although it does have its uses. Excellent article – thanks for the link, Mike. 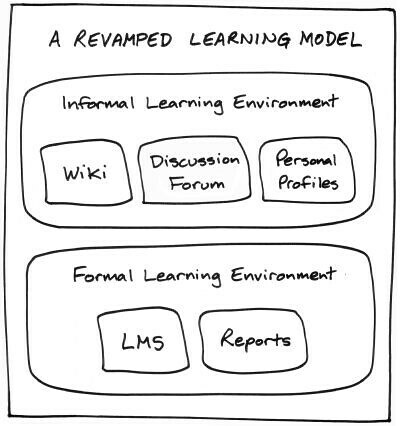 It’s interesting to see that the author’s open learning network (OLN) model combines the LMS and the PLE “into something completely different”. In contrast, I propose keeping them separate, while adding an ILE in the middle to bridge the gap. I know what you mean about the FLE being considered a learning environment. It isn’t really about “learning” is it, but the bureaucracy surrounding it. Technically speaking, I suppose an FLE is really a “learning related” environment – let’s not go there! This is something I’ve been looking at for a while. I agree with you, but with some subtle differences. You’re right that the LMS is dreadful at managing content. Instead, I would propose that the unifying factor between the FLE and ILE is a good content management system – for the formal, organisation-approved content. Of course, there will be content that doesn’t fit inside the CMS (eg. simulations, learning scenarios etc), but it should hold everything together. At the centre of the ILE (next to the search engine) would be an enterprise micro-blogging platform – like SocialCast, Yammer etc. From experience, I know that these quickly gain the critical mass required to make social learning work. These can also form the basis of your discussion forum. I’ve found that discussion forums tend to degenerate or fall stagnant very quickly, unless they’re focussed around a particular product or idea that is constantly being fed (through new developments). CMS – agreed, especially to feed the wiki. Search engine – excellent idea! Enterprise micro-blogging platform – absolutely. In fact, when I was talking about a discussion forum I had Yammer in mind. I don’t think the bells and whistles of a fully fledged discussion forum would add much value, given the wiki is meant to “house” organic knowledge. What is really required in that space is a transient communication vehicle. For that purpose, yes, a micro blog would be perfect. You’ve also nailed participation as major issue, and it is indeed my key concern with this model. IMHO, the success of social learning in an organisation is directly related to that organisation’s culture. If the employees aren’t collaborative and proactive team players, it just won’t work. Picking up the participation idea – from experience I know that 6 months into a bottom-up implementation of Yammer, we were seeing exponential growth and business-related connections being made that would never have otherwise happened.